I have always had weird and funny thoughts. For as long as I can remember, I’ve had strange ideas and notions running in my head, had so many questions bursting out of me and was never satisfied with the answers given, vexing and taxing even the most patient of souls around me at that time. I learnt later to keep most of my wondering and questioning to myself…it’s just easier that way. Many times I would play my little mind-game and focus on my own name and self, and soon reach that strange slightly disoriented state of dissociation, perhaps a little high and buzzed, but also wonderfully mellow and ’rounded’. [I can’t really describe the feelings in that state; basically everything feels right, nothing is out of place, there are no ‘sharp edges’. Only an encompassing sense of mild contentment, a feeling of being centered and at peace. Like looking at a yellow-brown sepia-toned old photograph from a better time and place. Thus: yellow mellow and ’rounded’. When I am in that state, that dissociated from Self state, it can be be quite liberating. I used to call it, the WHO AM I state, and I rather enjoyed entering that state, not least for the incredible focus and clarity of mind which it allowed me to have. Like a placid lake with nary a ripple on the surface, there were no distractions and wayward thoughts when I am in my WHO AM I state, and it allowed me tremendous focus towards solving problems, sorting through binomial-branching scenarios or just pushing new ideas to their limits. But of course, when naturally I began focusing on myself, my name (or worse, names of my loved ones), it can lead to some pretty scary results. To have a kid self-hypnotize into feeling dissociated from himself, to wander around in a discombobulated daze, and to say the strangest things and ask the strangest questions…it can freak some people out. Many times when I am in that state, I would question the perception of self, the perception of others, just Who am I?, do ‘I’ really exist, how do I know I or you truly exist and if we exist, are we really what we seem to ourselves, to each other? Might there not be an unseen veil or scales covering our eyes and causing us to see what we appear to be seeing, but not the actual reality? [Of course, I later found out I was not alone in asking these questions. These are age-old questions which have occupied Man from the beginning, and which at various times have been mused upon and very eloquently asked by distinct individuals across the breadth of humankind: by the ancient Indians at the very beginning of their civilization, by Chuang Tzu when he was dreaming of butterflies, and of course by Descartes when trying to outwit the Evil Daemon in his Theory of Other Minds. And among the few people unfortunate enough to be faced with my childhood questionings and rhetorical wonderings, Mum definitely bore the heaviest brunt. When I was young, I spent a lot time with Mum learning a host of different things: the intricacies of water-colour painting (how to mix and blend colours and avoid always ending up with dirty-brown!, and especially the importance of 留白/leaving white space in chinese water-colours); learning chinese and chinese literature, especially from some of her favourite literary works both classical and modern; or simply just listening to Mum’s rather extensive music collection together. I remember many lazy yellow-brown afternoons, usually over tea-time, we would be having painting sessions, or reading dreamy passages from 紅樓夢/A Dream of Red Mansions, while playing songs from our then sleek and state-of-the-art Yamaha turntable and player. And many times when concentrating on my painting and colours, or intently reading and gradually getting in-between-the-lines, a little schism will appear and I will simply slip through to enter into that still and dissociated state of mind. Many times rather then questioning, I would just launch into a stream of wonderings, musing aloud to Mum all the ideas and thoughts I have been developing in my head, not really expecting a response from her, but probably just feeling safe and secure enough in her presence to let it all out. 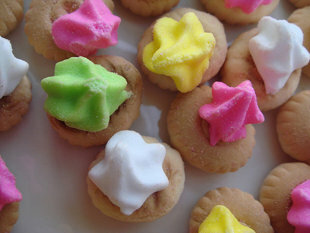 Deng-dengdeng-deng-deng-DENG in that familiar melody of 酒矸倘賣嘸 which we shared. At once, I would stop my wondering and wandering, smile up at Mum and go back to my painting or reading, and continue eating my ‘little gem’ icing biscuits. One of the scariest thing I did with my WHO AM I mind-game was to focus on Mum’s name, or rather my relationship with her. It was disconcerting to find that I was able to focus myself into ‘dissociating’ from the one most important person in my life; that somehow, I could focus/trick/meditate into uncleaving myself into the third person and look at my Self and its relationships dispassionately. I remember going up to Mum and asking her, why is she my mother and not someone else. I remember looking out of the window and pointing to a lady standing at the balcony of the house next door and asking, why isn’t she my mother instead? Why am I here in this body, looking out of this pair of eyes at that woman in the balcony, and not there in her body, looking out of her eyes from her balcony at me instead? Mum laughed, tousled my hair and told me to quit eating so much biscuits or I’ll spoil my dinner. But years later, she revealed that actually she had been really worried for me when I was young and had even discussed with my father about taking me to see a child psychiatrist. Previous thoughts of childhood reveries, the boundaries between One and Other, mind(-bending) games, and also of a longtime influence — an artist and his perspectives, geometric paradoxes and warped lines…led me to think of this song. Parallel Lines, from Kings of Convenience. How long will such trouble continue to flare up? How long will it take before these old ghosts can finally be laid to rest? I speak with utter sorrow for your people; your letter has hurt me to the depths of my being. I know that one day the disillusionment of your people will be complete, and through laborious centuries they will have to clear the debris of their civilisation wrought to ruin by their own warlords run amok. They will realise that the aggressive war on China is insignificant as compared to the destruction of the inner spirit of chivalry of Japan which is proceeding with a ferocious severity. You do not realise that you are glorifying your neighbour at your own cost. But these are considerations on another plane: the sorrow remains that Japan, in the words of Madame Chiang Kai-shek which you must have read in the Spectator, is creating so many ghosts. Ghosts of immemorial works of Chinese art, of irreplaceable Chinese institutions, of great peace-loving communities drugged, tortured, and destroyed. “Who will lay the ghosts [to rest]?” she asks. Mum loved watching movies, especially the Taiwanese 爱情文艺片 (transliteration: love and culture films) of the 60s and 70s. 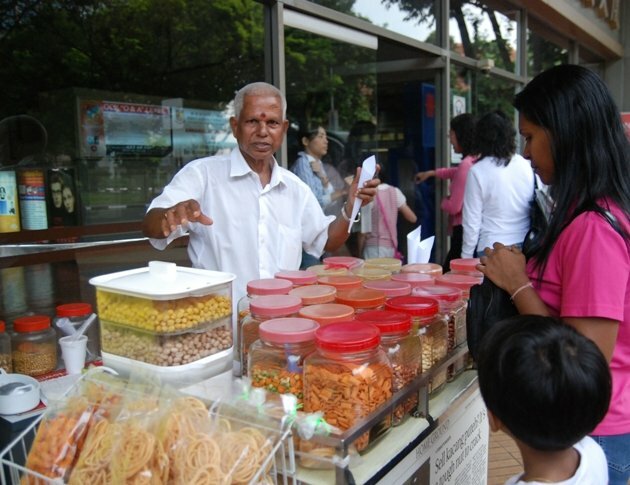 Even by the time after I came along, her enthusiasm flagged not a bit; I remember many excursions to the movie theaters with Mum and Dad, with me perched on her lap, munching and holding my favourite kacang-puteh (peanuts in a paper cone) in hand. This was the time before twelve-dollar Jumbo Combos of popcorn nachos and soda. Taiwanese 爱情文艺片 (love-culture films) usually feature tall and debonair leading men with thick mullets in their 70’s bell-bottoms, and beautiful willowy leading ladies with their soft long tresses; and with both reciting and exchanging their lines in very proper, formal chinese that is reminiscent of classical poetry, or singing and serenading each other with love songs while effortlessly playing a variety of musical instruments — as befitting the ‘文艺-culture’ in its namesake after all. No dashing handsome male leads for beautiful fragile damsels to swoon over in this movie. In fact, the leading actor in the film is the man whom I remember the pan-Asia chinese media declared as the 第一丑男/ugliest leading man in the chinese film industry, the veteran Taiwanese actor, Sun Yue 孙越. 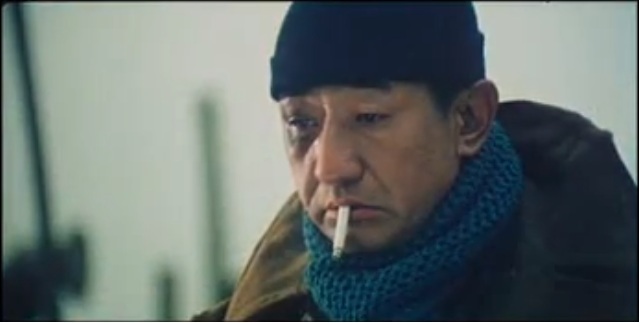 Sun Yue’s large bulbous nose and craggy hangdog features, together with his impeccable acting skills, was perfect for the character of 哑叔-Uncle Mute, the mute army veteran and rag-and-bone man struggling to make a living and survive in one of the many 眷村 (poor rundown ‘army’ villages housing retired KMT/Nationalist army vets and their families) dotted all over Taiwan. 哑叔-Uncle Mute, the rag-and-bone man struggling and living almost day-to-day, hand-to-mouth, but with very simple needs and wants, is content with his simple pleasures — a pack of cigarettes, a bottle of coarse rice wine, the warmth of the bed he shares with his lady companion. 哑叔-Uncle Mute gives up his drinking, instead of wine he now buys milk powder for his new-found baby daughter; he gives up his lady companion and his desultory dissipative life and worked harder than he had ever before to provide for the new center and lady of his life. As a mute, Uncle Mute cannot shout out the familiar melodious cry and refrain that the local rag-and-bone men will use to announce their presence and request: 酒矸倘賣嘸 Any Empty Wine Bottles To Sell? Instead, Uncle Mute blows an old army bugle from his days as an army bugler and military band trumpeter, in the familiar melody of 酒矸倘賣嘸, so that anyone who hears his bugle sounds will know it is Uncle Mute coming round to collect empty wine bottles. And as his precious little baby girl grows up, Uncle Mute frets over not being able to speak to her communicate with her, beyond the coarse guttural sounds that his throat is only capable of making. But one mode of expression which is crystal clear between them, and belongs uniquely to the father and daughter pair, is the simple 酒矸倘賣嘸 melody, especially when Uncle Mute tinkles and taps it out with a chopstick against an empty wine bottle: Deng-dengdeng-deng-deng-DENG. The baby girl, Ah Mei, grows up into a bright and pretty young lady, and unlike her adoptive mute father, she is blessed with a wonderful voice and a talent for singing. But soon, the young lady grows restless and chafes at being stuck in the boondocks, and wishes for nothing more than to board and take the first train out of this small and poor village to take to the stage and live her dreams under the big bright city lights. She is soon scouted and groomed to become the next big star and singing sensation. For various and heartbreaking reasons, she is then forced to deny and shun her father, as well as her relations with the poor village she grew up in. The film moves into its final stage; Ah Mei, now a famous singer and international star, triumphantly opening her concert on the largest stage in the country. But midway through, an interruption and bad news: 哑叔-Uncle Mute had collapsed while watching her on TV and is now lying on his death-bed. Ah Mei dashes off the stage still in her concert costume and rushes to see 哑叔-Uncle Mute…but its too late. Broken heart, tears, regret, shame… Had Ah Mei really boarded the wrong train, and chosen the wayward path? She returns to the stage, this time shrouded in stylized funereal sackcloth, and sings a different song, one embedded with the familiar melody and refrain that once had given her life, given her hope, given her love…singing it with the utmost of thanksgiving, and the deepest of mournful regret. An 哀悼曲－funereal song. Without heaven, where would earth be? Without earth, where would home be? Without home, where would you be? What would my fate be? 搭錯車 9/9 Papa, Can You Hear Me Sing? 搭錯車 1/9 Papa, Can You Hear Me Sing? I heard this song a few evenings ago, while out walking along the park and beach. It was the evening the haze returned with a vengeance, but I desperately needed my walk and ‘airing’ that day and so ventured forth regardless. As I walked, I could see in the distance sitting at a pavilion the familiar figure of an old man, another frequent visitor and walker in this park. I have seen him several times before, this old man, who would walk leisurely about while carrying of all things, an old cassette-tape player, and playing tapes of very old mandarin songs. No solitary enjoying of songs from an ipod or smartphone packed with a thousand songs for this old man; he apparently prefers to share his favourite tunes with all and sundry, playing old songs from the 70s, 60s, even 50s from his tape player, occasionally popping in a fresh tape from a bag he carries in his other hand. Very old school… I like. But this time, the haze was really uncomfortable, so I wanted to just smile nod and be on my way. Here is a song by one of my favourite female singers of mainstream Mandarin music from the 90s. 萬芳 Wan Fang, apart from having one of the better vocals and range at that time, probably had the most expressive and emotive voice among her peers. In this 2008 video, 萬芳 Wan Fang is singing a song she first recorded fifteen years ago in 1993. In this relatively recent mini-concert she held as part of her comeback tour, though the years may have left their marks on her, they seem to have also imparted a beautiful 沧桑 edge and echo to her voice that only time and experience can do. She may be in her forties now and despite what detractors once said of her looks, 萬芳 Wan Fang will always be beautiful to me. And here is the same song sung by Wan Fang from 1993. 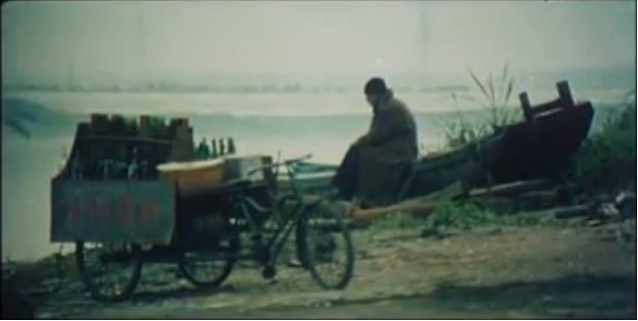 This music video is from the 1993 Hong Kong movie of the same name, 新不了情 A Love That Never Ends. This movie is so sad…and so good. Another piece of music that is immediately arresting within its first few notes, truly has a ‘beat that my heart skipped’: the Butterfly Lovers’ Violin Concerto composed in 1959. While this orchestra composition is already not that new, some of the melodies within the composition are actually based in part on 地方/local operatic arts that have been passed down and performed for hundreds of years, and of course all inspired by that old and beautiful Chinese folktale, 梁祝/Butterfly Lovers. I believe the first two minutes of this first part, from the light ethereal flute opening, to the wistful oboe transition, into the much anticipated and achingly sad and beautiful violin solo, is probably the most recognizable of all Chinese music for all Chinese people anywhere for some generations now. Many a stoic Chinaman who may not know the story, will get teary-eyed upon hearing the familiar tune. “And of the many dramatized versions of the 梁祝/Butterfly Lovers story in recent decades, the above 1994 film version by the mercurial-Mercutio maverick genius director, Tsui Hark, is my favourite. Tsui Hark’s film version, while ostensibly a romantic-comedy, does full justice to the tragedy that is at the heart of the story. And with his breath-taking scenery and cinematography, beautiful sets and costumes, and a wonderfully arranged adaptation of the musical score, he hits all the right notes; especially with a few precious scenes and moments which for me, are amongst the most tragic and heart-breaking evocations in cinematic art. That is, my generation, while coming of age in the 1990s. Need to give a little sigh for the 玉女/dream goddess of my teen years: Charlie Yeung/楊采妮. The film director/producer Tsui Hark made a casting coup when he casted the 19 year old Charlie Yeung as the female lead, Zhu Yingtai in the 1994 film. And of course, he scored another stunning coup by reuniting and casting her in his 2005 film 七劍, when the now older but still so lovely Charlie Yeung made a brave comeback after her shock retirement at the age of 23. In more recent years, when I first heard the Ryukyuan/Okinawan singer Rimi Natsukawa sing the song Nada Sōsō/Spilling Large Tears, the soft but very intense native style she sang in, the beautiful melody composed by the Okinawan band BEGIN, the use of the traditional Sanshin 3-string instrument, and most especially, the painfully tender and plaintive lyrics written by Ryoko Moriyama… I was reduced to a weeping mess. Even now, I cannot bring myself to translate the song lyrics.